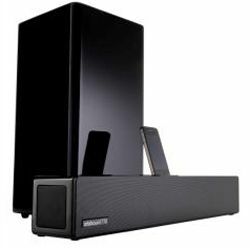 Orbitsound releases T12v3 soundbar and iPod dock | What Hi-Fi? Orbitsound has released a new version of its T12 soundbar, the T12v3. It still boasts an integrated iPod dock and comes with a subwoofer, but Orbitsound claims improved sound quality alongside some new features. Designed to improve your TV's sound without filling your room with speakers, the T12v3 can now play video and music straight from a docked iPod or iPhone, has a new remote with greater functionality, and claims improved sound. The third incarnation of the soundbar still delivers Orbitsound's patented 'spatial stereo' technology, which aims to better spread sound around your room. You'll find digital and analogue audio connections so you can connect your TV, games console, laptop or other music source. The T12v3 is due on sale in September for £299.